SNAV fleet consists of hydrofoils, catamarans and high-speed vessels. All the boats stand out for the service quality and safety. The interiors are looked-after in the finest details in order to offer a pleasant trip to passengers. SNAV high-speed vessels are of different type and offer outstanding on-board comforts and amenities to passengers. The ships in fact are characterised by interiors looked after in the finest details. The halls equipped with armchairs are extremely cosy and allow passengers to spend their trip in total relax. SNAV high-speed vessels will lead you at the discovery of the most beautiful corners of the Mediterranean Sea after a pleasant journey. The safety and efficiency of every ship are guaranteed by the meticulous maintenance carried out on a daily basis by highly specialised staff. Travelling is relaxing on-board SNAV high-speed vessels. Live this experience with us! SNAV catamarans are a quick and safe means of transportation. The boats carry passengers and operate in the Gulf of Naples and Adriatic area. SNAV catamarans offer excellent performances; their safety is guaranteed by constant maintenance. SNAV catamarans feature various on-board amenities among which coffee bar and access for disabled. The interiors are looked after in the finest details as it stands out from the halls equipped with comfortable armchairs where the passengers can spend their trip seated in total comfort. On-board our catamarans, you can reach your favourite destination quickly and with a pleasant journey. Re-discover all the excitement of travelling with SNAV! 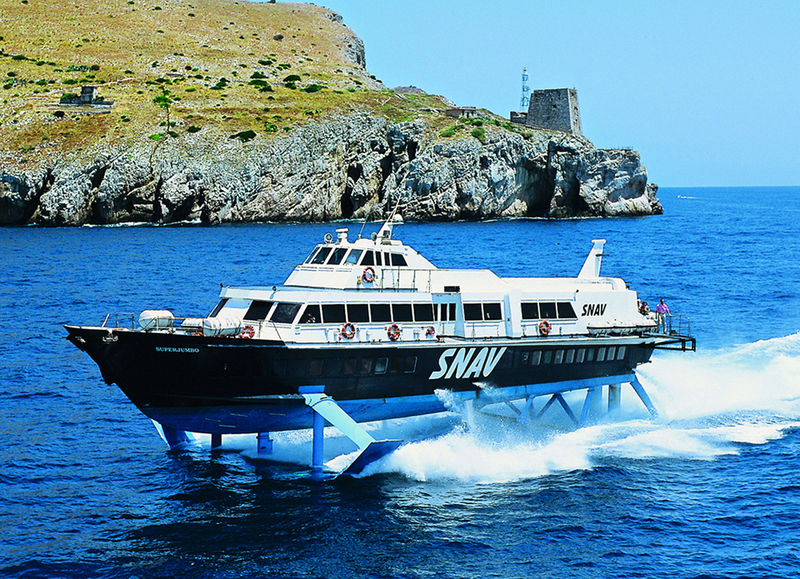 SNAV hydrofoils operate in the Gulf of Naples and Adriatic Sea, carrying exclusively passengers. On-board the boats, you can spend the trip in total comfort thanks to the cosy halls equipped with armchairs. The boats feature various amenities among which access for disabled and coffee-bar. All SNAV boats are duly certified for navigation in national and international waters. SNAV hydrofoils ensure a pleasant, quick and above all safe navigation. Efficiency and high performances characterise our hydrofoils that will pleasantly carry you towards your dream holidays.